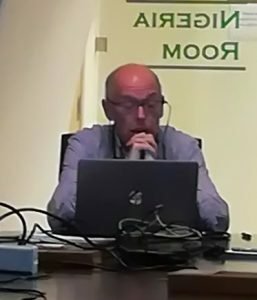 The w orkshop was held at the FAO headquarter in Rome, organized and coordinated by the Products, Trade and Marketing Branch (FIAM), as partner of the MedAID project (H2020; GA no. 727315) and co-leader of Task 6.3 (WP6: Economics), in cooperation with the General Fisheries Commission of the Mediterranean (GFCM) as col-leaders of WP7 (Governance). 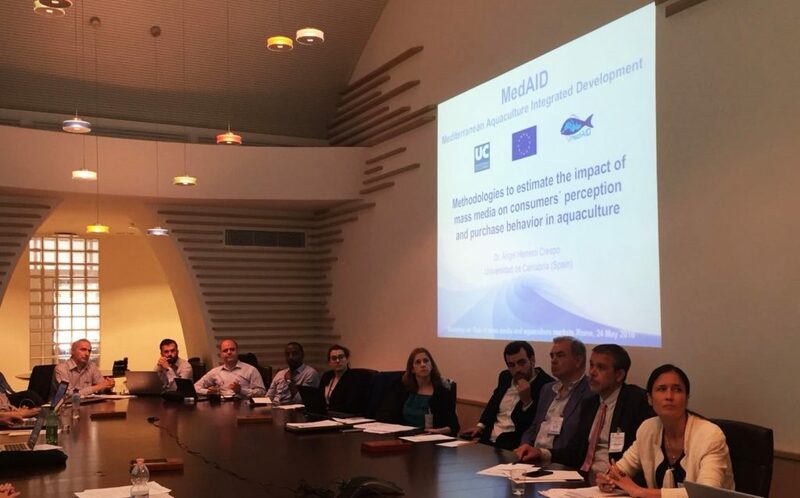 MedAid is an EC funded project aimed to improve the efficiency and performance of the Mediterranean aquaculture industry. Mass media are a matter of concern for the two working packages since they may affect perceptions about aquaculture in a broad band of audiences. In a more specific focus, the impact of the information released in the media on consumers, retailers and policymakers attitudes and behavior with regard the aquaculture industry and its products. The workshop provided a forum for discussion and review of methodologies, up to date findings and further steps in the analysis. A total 26 participants, including MedAid and PerformFish projects, FAO staff, and representatives of National Governments, producers’ associations and specialized journalists of the three countries targeted in the fieldwork case studies (Spain, Italy and Greece), contributed to the presentations and discussions. The morning sessions focused on describing the most updated figures and trends in aquaculture production and trade in Mediterranean aquaculture, introduce the MedAid project and working packages 6 and 7. Special attention was given to discuss the methodology to be used in a case study covering the impact on market behavior from the information released on traditional newspapers. Discussions were held in the afternoon, by splitting the main group into two allocated according to the participant’s priority on media or governance. A final session summarized and presented the conclusions of the workshop. Among the topics discussed, participants highlighted the poor knowledge about aquaculture in the mass media and a higher likelihood of publishing negative than positive information. Frequently the information provided in the media is so technical and difficult to understand by a non-skilled audience. On the opposite side, the industry lacks of a sustained common communication strategy. Communication campaigns are rarely undertaken without public funding. At the company level, mass communication is almost inexistent and limited to react to alarms and negative news. Regular sectoral meetings with the media to clarify concepts and update about the progress, good practices, and social responsible actions may contribute to improve the perception of the media and the community. On the other side, it is important to diversify media and targets. Traditional media cover a large and wide audience in a one direction way. Interactive communication in social media is growing attention across consumers as a way for acquiring information about companies and products, and their influence in purchase decisions is increasing. Diversification of targets is recommended since consumers may not be interested in technical information or may misunderstand the meaning. For these and other reasons consumers may not relay on information provided in the media and would look for alternative sources one of the most frequent is provided by the salesperson at the retail place. Retailers have a strong influence on consumers decision making but may not be proactive toward aquaculture species if they do not manage an adequate information. Like in the case of the media, informational contacts with retailers, and in special with the salesperson in contact with consumers, are expected to help contributing to the improvement of consumers perceptions about aquaculture in general and of certain species in particular.